Today’s Wallpaper Wednesday brings you this vibrant, knock-out design from Kelly Hoppen, at Graham and Brown. 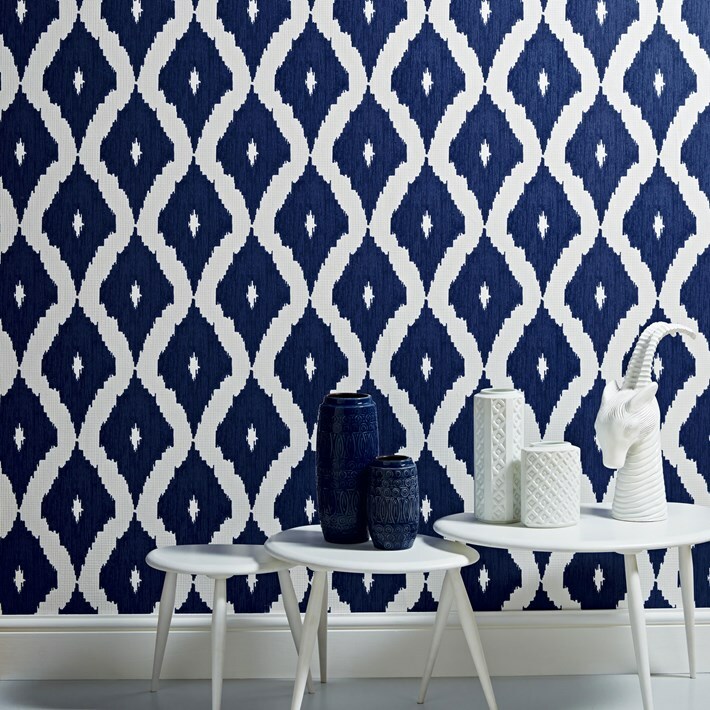 A contemporary take on the Ikat design trend in blue and white is inspired by Kelly’s love of Asian design culture and traditional fabric designs. This geometric wallpaper design co ordinates with a linen texture and features shimmering highlights. Indigo, or dark blue is another big colour trend for this year, which you can find in all kinds of interiors and accessories. I love that it’s so striking when teamed, as here, with the starkness of white, yet is rich and warm too. Keep it simple with the white, or mix it up and add some contrasting hues of yellow and gold. Copper, another great trend for this season, would also look stunning mixed the indigo, as would pastels. The list is endless really and you can’t go wrong with this colour, and this kind of design. Take a look around and you’ll see this Ikat style design everywhere. Ikea have a big range this season, which would work really well with this wallpaper design, and Habitat is another fan of the geometric, Asian pattern. It’s a great price too. For just £26 per roll, you’re getting a designer paper, and making quite a statement. What do you think? Could you see yourself using this in your home? Kellys Ikat is available from Graham and Brown, and if Indigo isn’t your thing, it’s available in several other, more subdued colourways too. Ooh fabulous, sounds like a lovely idea!